Wallo Brands round access panels selected as “Product of the Week” by The ACHR NEWS magazine! – Wallo Brands | Providing Quality and Value to Consumers Worldwide. 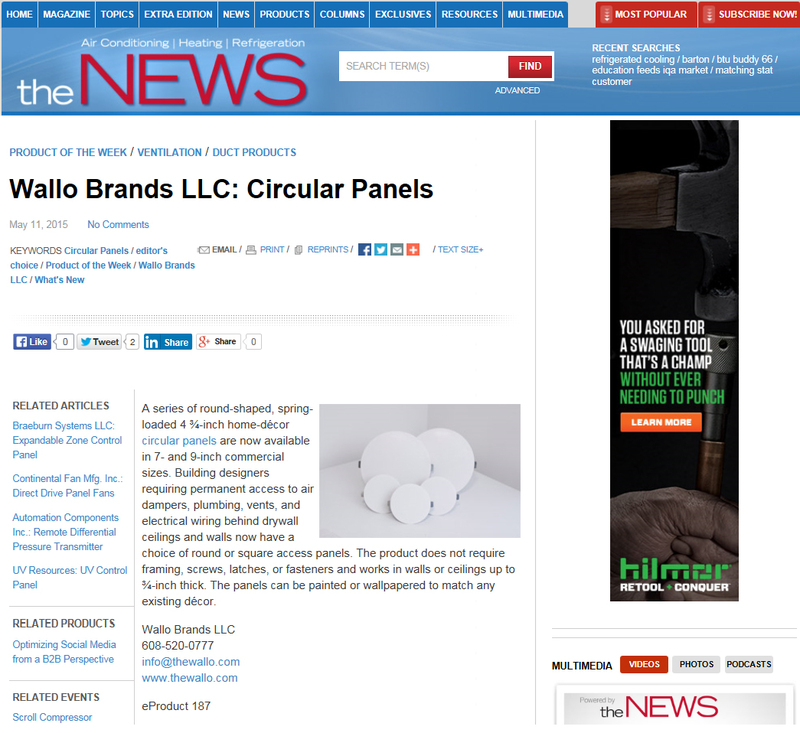 Home/Press Release/Wallo Brands round access panels selected as “Product of the Week” by The ACHR NEWS magazine! We’ve got great news today; we’ve been selected as Product of the Week 05.11.2015 by The ACHR NEWS magazine. A series of round-shaped, spring-loaded 4 ¾-inch home-décor circular panels are now available in 7- and 9-inch commercial sizes. Building designers requiring permanent access to air dampers, plumbing, vents, and electrical wiring behind drywall ceilings and walls now have a choice of round or square access panels. The product does not require framing, screws, latches, or fasteners and works in walls or ceilings up to ¾-inch thick. The panels can be painted or wallpapered to match any existing décor. Follow us on Twitter and Facebook and we’ll keep you up with the updates. By Daniel Febbraro|2017-05-18T18:39:52+00:00May 22nd, 2015|Press Release|Comments Off on Wallo Brands round access panels selected as “Product of the Week” by The ACHR NEWS magazine!